Since New Year’s Day is the beginning of the days of the year, we ought to gather in our soul those thoughts, feelings, and dispositions that would direct our affairs throughout the year in a Christian way. We will find these the moment we bring to mind the meaning of New Year’s Day in the spiritual life. In the spiritual life, New Year’s Day is when one who has been living carelessly becomes zealous about salvation and pleasing God. When one makes this resolution, then all is rebuilt afresh both internally and externally, upon new beginnings – the old passes away and all is new. If you have this, renew it; if not acquire it – and for you this will be a New Year’s Day. In Acts 15, we read how the Holy Spirit inspired the first council ever held in the Church, the council of the Holy Apostles in Jerusalem, to abrogate the obligation of physical circumcision for the Gentile converts to the Faith. The Church had a new and far greater initiation into the life of grace: Holy Baptism, which was not for men only but for women as well. But the image and true meaning of the old circumcision still remain: We must cut away our fleshly passions, which enslave us and prevent spiritual life, and we must be totally dedicated to God in body and in soul. The baptismal grace is always there, but it does not energize in us unless we cooperate. Thus in his meditations for today, St. Theophan exhorts us to examine our lives and to re-dedicate ourselves to doing the Lord’s holy will with all our hearts. On this day also the Lord received His name, the name above every name, the Name of JESUS, which the archangel had foretold to the Holy Virgin and commanded to be given to the Child by St. Joseph at His circumcision. We can regard this day, then, also as the day on which the Lord Jesus gives us His name as an invincible weapon against the enemies who fight against us, and re-dedicate ourselves to the Prayer of Jesus. This is an essential weapon in our struggle to acquire the true circumcision of the heart. On this day also the Lord Jesus shed His Precious Blood for the first time, foreshadowing His divine Passion for our salvation. One drop of this Blood is more precious than the whole universe, and yet He did not hesitate to mount the Cross and shed all of His Blood for us. How can we not desire to return such love with all our hearts? This profound Feast of the Lord coincides by God’s Providence with the day on which St. 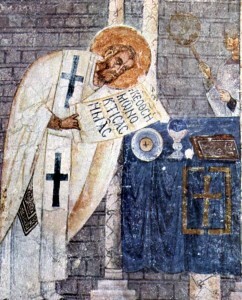 Basil the Great departed this earthly life at the age of 50, having been a baptized Christian for a mere seventeen years and a bishop for only ten! In those few years, he fought ceaselessly for the Orthodox Faith against the Arians, Eunomians and other heretics, struggled constantly for the unity of the Church in the East, established monasteries and hospices for the poor, rooted out corruption in the clergy, ordained many worthy bishops and priests, wrote commentaries on Holy Scripture and composed divine services, and, in short, became the perfect model of the bishop, combining the life of intense prayer and extreme fasting with ceaseless activity for the salvation of souls. And throughout this time, he was almost constantly ill: at one point, according to one of his letters, he had a fever continuously for 50 days. By the age of 45, he had lost all of his teeth. At age 50, utterly worn out by a life of total self-denial, he reposed in the Lord. As he was dying, did he see “success” crowning his life? By no means. Many heresies and schisms were still tearing the Eastern Church apart: reposing in 379, he did not live to see the triumph of the Orthodox Faith with the accession of the Emperor Theodosius the Great and the Second Ecumenical Council in 381. But what was important to him was that he reposed in the grace of Christ, in repentance, in the secure knowledge that he had done everything possible, with all his strength and every last breath, to do God’s holy will. What more could any of us ask for? The duty is ours; the consequences are God’s. By the prayers of Great Basil, let us love the Lord with all our hearts and do His holy will. He will take care of the rest.